Football Drops Homecoming Game to McDaniel | The Gettysburgian. McDaniel College shutout the Gettysburg Bullets on Homecoming. Though the defense stood strong all game, the Bullets offense could not get going in the 25-0 loss. The Gettysburg Offense struggled all game long. The Bullets managed only 33 rushing yards and 90 passing yards, in addition to turning the ball over four times. At quarterback, sophomore Ryan Finley made his first career start. He finished with 90 yards on 14 completions. Senior Johnny Davis led receivers with 49 yards on 3 catches, while senior Chase Fee added 5 catches for 30 yards. The defense was on the field for most of the game, racking up 40 minutes of play time on 83 plays and stingily giving up 350 yards. Coach Kevin Burke said that he thinks the defense was playing better than it looked like in the stat column. On defense, sophomore Jack Humphries and senior Jake Skinner led the team with 14 tackles. Senior Logan Aikey also added 12 tackles, 1.5 tackles for loss, and a forced fumble. For the defensive backs, sophomore Thomeir Richardson tallied 3 tackles, 1 pass break up, and an interception. It was a long day for the Gettysburg offense as they got off to a slow start. On the first drive, Finley missed his receiver deep behind the defense. “It’s early. You have got to move on. You want to hit that shot, you practice it, you try to get it,” Coach Burke said, commenting on the missed opportunity. The first half was about field position and defense. McDaniel’s punter Joey Cornwell put the Gettysburg offense way back in their own territory with a 71-yard punt to Gettysburg’s 2-yard line. Gettysburg punted after a 9-yard drive, and McDaniel followed with a 13-play drive resulting in a field goal to go up 3-0 with 3:08 left in the first quarter. To begin the second quarter, McDaniel stopped Gettysburg and put together a 7-play, 70-yard drive capped off by a 4-yard run for a touchdown. Just 18 seconds later, Gettysburg quarterback Finley fumbled on the ensuing possession, and McDaniel got the ball back. But the Green Terror didn’t have the ball back for more than a minute before Thomeir Richardson jumped a curl route and tipped the ball to himself for the interception. “He lets you do a lot of different things on defense. He plays the ball extremely well in the air,” Coach Burke said of Richardson. Both defenses did their job as the half closed with McDaniel up 9-0. 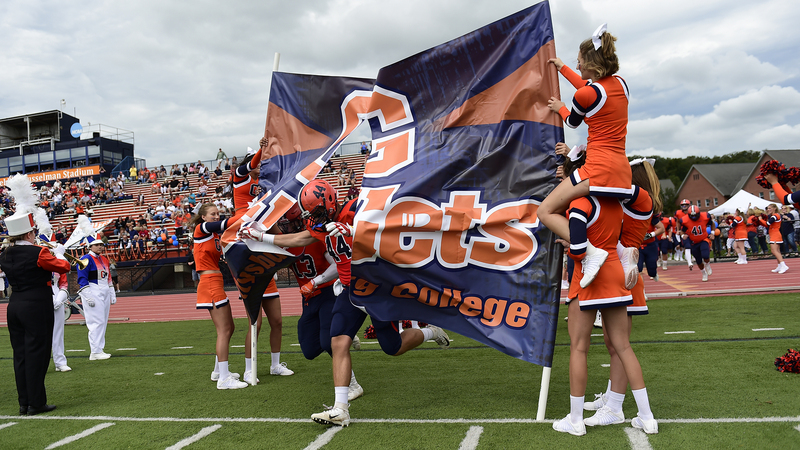 The Gettysburg offense barely saw the field in the second half as the offense totaled 6:16 minutes of possession, amassing 6 drives totaling 42 yards. The defense held off McDaniel for two solid drives to start the half. But with 4:58 left in the third, McDaniel’s running back Isaac Murray broke free for 20 yards and scored to increase the lead to 16-0. With 5:16 left on the clock in the fourth quarter, the Gettysburg defense forced a 4th and 5. McDaniel’s quarterback Tyler Palermiti connected with Aaron Grant for 28 yards to continue the drive. On the next play, John Chamberlain ran it in for a 4-yard touchdown to make it 23-0 McDaniel. Minutes later, McDaniel finished off Gettysburg with a 2-yard sack for a safety to end the game 25-0. Gettysburg will look to turn their season around this Saturday, playing a conference game away at Moravian at 1:00 pm.